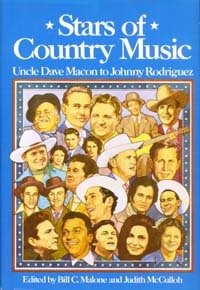 To help celbrate the fiftieth anniversary of the Grand Ole Opry, here is a lively collection of original essays on many of country music's most important performers, such as Jimmie Rodgers and the Carter Family to the ppopular stars of the seventies, including Johnny Cash, Loretta Lyunn, Merle Haggard, and Charley Pride, leading authorities offer full and colorful portraits of the personal lives and careers of nineteen artistswith special emphasis on their styles, repertoires, and significance in the history of the music. Introducing the cavalcade of singers and musicians is a chapter on early pioneers like Fiddlin' John Carson and Carl T. Sprague, while the concluding chapter, "A Shower of Stars", takes a look at popular entertainers of the past thirty years. The contributors themselves constitute a who's who of country music writers and scholars, all of whom have already demonstrated their knowledge and insight, whether through books, articles, record liner notes, radio shows, newspaper columns, concerts, or classrooms. Several have been at work for years on the definitive biographies of their subjects. Others are skilled musicians in their own right; and some ohave performed with the people they are writing about. Together, they weave an animated narrative about country music and its stars and communicate to the reader their enthusiasm for this dynamic segment of American culture. Bill C. Malone is associate professor of history at Tulane University and author of Country Music, U.S.A.
Judith McCulloh is an editor at the University of Illinois Press and has written several articles on country music.